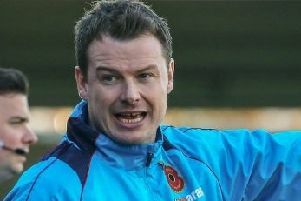 Chorley boss Matt Jansen has not ruled out a January swoop for departing Accrington Stanley striker Marcus Carver. Carver made his last appearance for the Magpies in Saturday’s 3-1 victory over Stockport County. The striker’s 93 day emergency loan deal is up but despite only scoring twice in that spell Jansen hailed the forward for his work ethic and hinted he may try and secure his services from the League Two club again in January. Chorley’s new loan signing Dean Rittenberg hit the woodwork in his first substitute appearance for the Magpies. The Blackburn Rovers striker was straight in the mix and Jansen was impressed with the 19-year-old. He said: “Dean came on for the last 10-15 minutes and he nearly scored, he hit the post. The 3-1 win was Chorley’s third successive victory and now the Magpies are ninth in the National League North table - just three points away from a play-off spot. And Jansen is hoping to continue that winning streak when Chorley host 15th-placed Bradford Park Avenue on Saturday. He said: “It was a big result against Stockport. “They threw everything at us in the first half. “I thought the second half was our best performance of the season, we could have won by five or six. “I’ve had Bradford watched the to assess their strengths and weaknesses. And after scoring seven goals in the last three games Jansen is pleased his men are starting to find a clinical edge. He said: “It was a slow start but I said it would take time as I have got to find my best team. “We have dominated games and not got the results but now we have started to get those results and I am hoping we continue to do so. “We have been creating chances and after scoring six in the last two games that should give us confidence. Josh Hine has been struggling with a shoulder knock over the last couple of weeks but bagged his ninth of the campaign on Saturday. Darren Stephenson also rippled the back of the net and scored his sixth of the season and Jansen says that low-scoring striker’s James Dean and Carver have played a big role in creating space for the duo to hit the target. He said: “Josh hasn’t been 100% but he wanted to play and it is great that he wants to play. Josh and Daz have been getting goals, there have not been a lot of goals from the men in the middle like Deano and Marcus but that is because they have been causing problems to allow Josh and Daz to have the chances. Captain Andy Teague has missed the last two games against Nelson and Stockport but Jansen says the skipper should be back on Saturday.